• The department store is being patronized by more than 10 percent of the households. • The heavy and light users of a brand differ in terms of psycho-graphic characteristics. • One hotel has a more upscale image than its close competitor. • Familiarity with a restaurant results in greater preference for that restaurant, and should be reviewed. 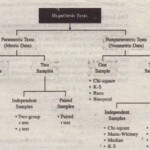 Now we describe a general procedure for hypothesis testing that can be applied to test hypotheses about a wide range of parameters. 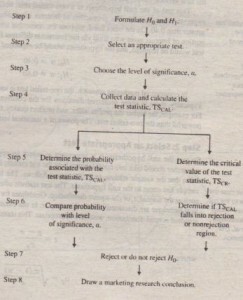 The following steps are involved in hypothesis testing (Figure 15.3). 1. Formulate the null hypothesis Ho and the alternative hypothesis H¹. 2. Select an appropriate statistical technique and the corresponding test statistic. 3. Choose the level of significance. 4. Determine the sample size and collect the data. Calculate the value of the test statistic. 5. Determine the probability associated with the test statistic under the null hypothesis, using the sampling distribution of the test statistic. Alternatively, determine the critical values associated with the test statistic that divide the rejection and non-rejection regions. 6. 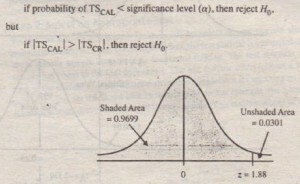 Compare the probability associated with the test statistic with the level of significance specified. Alternatively, determine whether the test statistic has fallen into the rejection or the non rejection region. 7. Make the statistical decision to reject or not reject the null hypothesis. 8. Express the statistical decision in terms of the marketing research problem. The first step is to formulate the null and alternative hypotheses, A null hypothesis is a statement of the status quo, one of no difference or no effect. If the null hypothesis is not rejected, no changes will be made. An alternative hypothesis is one in which some difference or effect is expected. Accepting the alternative hypothesis will lead to changes in opinions or actions. Thus, the alternative hypothesis is the opposite of the null hypothesis. The null hypothesis is always the hypothesis that is tested, The null hypothesis refers to a specified value of the population parameter (e.g., p, a; π),not a sample statistic (e.g., X, s, p). A null hypothesis may be rejected, but it can never be accepted based on a single test, A statistical test call have one of two outcomes, One is that the null hypothesis is rejected and the alternative, hypothesis is accepted. The other outcome is that the null hypothesis is not rejected based on the evidence. However, it would be incorrect to conclude that because the null hypothesis is not rejected, it can be accepted as valid. In classical hypothesis testing, there is no way to determine whether the null hypothesis is true. the new service should not be introduced unless additional evidence is obtained. In commercial marketing research, the one-tailed test is used more often than a two-tailed test,Typically, there is some preferred direction for the conclusion for which evidence is sought. For example, the higher the profits, sales, and product quality, the better, The one-tailed test is more powerful than the two-tailed test. 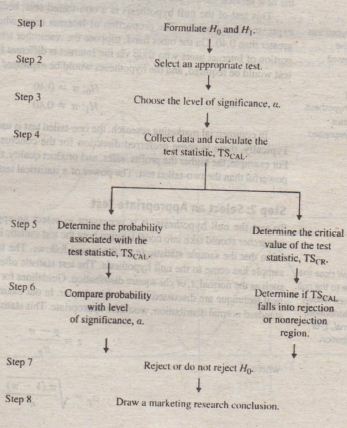 The power of a statistical test is discussed further in step 3. Whenever we draw inferences about a population, there is a risk that an incorrect conclusion will be reached. Two types of errors can occur. TYPE I ERROR Type I error occurs when the sample results lead to the rejection of the null hypothesis when it is in fact true. In our example, a Type I error would occur if we concluded, based on the sample data, that the proportion of customers preferring the new service plan was greater than 0.40, when in fact it was less than or equal to 0.40. 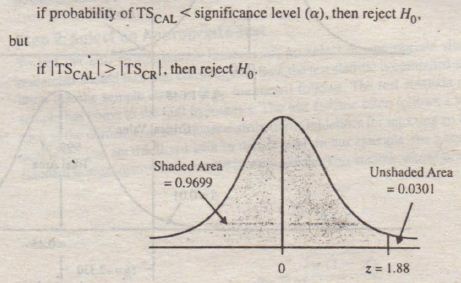 The probability of Type I error (a) is also called the level of significance. The Type I error is controlled by establishing the tolerable level of risk of rejecting a true null hypothesis. The selection of a particular risk level should depend on the cost of making a Type I error. TYPE” ERROR Type II error occurs when, based on the sample results, the null hypothesis is not rejected when it is in fact false. In our example, the Type II error would occur if we concluded, based on sample data, that the proportion of customers preferring the new service plan was less than or equal to 0.40 when, in fact, it was greater than 0.40. 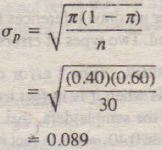 The probability of Type II error is denoted by β. Unlike a, which is specified by the researcher, the magnitude of βdepends on the actual value of the population parameter (proportion). The probability of Type I error (α) and the probability of Type II error (β)are shown in Figure 15.4. The complement (1 – (3) of the probability of a Type II error is called the power of a statistical test. POWER OF A TEST The power of a test is the probability (1 – (3) of rejecting the null hypothesis when it is false and should be rejected. Although β is unknown, it is related to a, An extremely low value of a (e.g., = 0.001) will result in intolerably high β errors. So it is necessary to balance the two types of errors. As a compromise, a is often set at 0.05; sometimes it is 0.01; other values of a are rare, The level of a along with the sample size will determine the level of β for a particular research design. The risk of both a and β can be controlled by increasing the sample size. For a given level of a, increasing the sample size will decrease β, thereby increasing the power of the test. Sample size is determined after taking into account the desired a and β errors and other qualitative considerations, such as budget constraints. Then the required data are collected and the value of the test statistic computed. In our example, 30 users were surveyed and 17 indicated that they used the Internet for shopping. 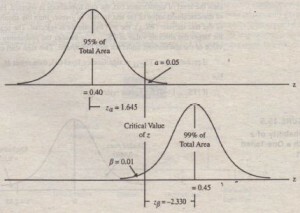 Thus the value of the sample proportion is p = 17/30 = 0567.
value of the test statistic, the area in the tail beyond the critical value is either 0 or a/2. It is 0 for a one-tailed test and 0/2 for a two-tailed test. The conclusion reached by hypothesis testing must be expressed in terms of the marketing research problem. In our example. we conclude that there is evidence that the proportion of Internet users who shop via the Internet is significantly greater than 0.40. Hence, the recommendation to the department store would be to introduce the new Internet shopping service. As can be seen from Figure 15.6, hypotheses testing can be related to either-an examination of associations or an examination of differences. In tests of associations, the null hypothesis is that there is no association between the variables (Ho: … is NOT related to … ). In tests of differences. 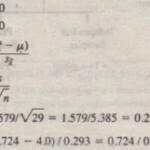 the null hypothesis is that there is no difference (Ho: … is NOT different from … ). Tests of differences could relate to distributions, means. proportions, medians, or rankings. First, we discuss hypotheses related to associations in the context of cross-tabulations.